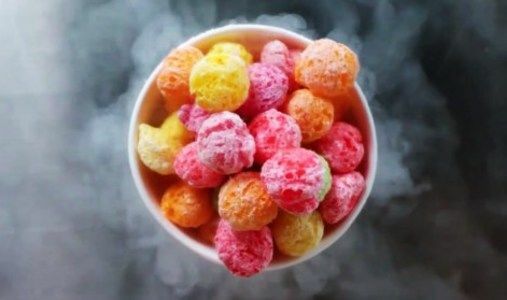 Description: Liquid nitrogen puffs are a novelty dessert made of fruity cereal puffs soaked in liquid nitrogen. Pour the cereal in a large bowl. While wearing gloves, pour the liquid nitrogen over the cereal so it is soaked in liquid nitrogen. Use a toothpick to pick up the cereal and pop in your mouth. Chew and exhale to breath like a dragon!